Queen Isabella Causeway after Dark Pano – Looking out on the Queen Isabella Causeway after dark you can still see a little color left in the sky from the sunset earlier in the evening. This bridge is two miles long and is the only route in to South Padre Island. The light on the bridge are reflecting back in the water after dark. The Queen Isabella Causeway is about two miles long and is the sole source for getting to the island from the mainland by vehicals. In 2001 a barge hit the bridge and destroyed a 160 foot section and till it was rebuilt the people had to travel by ferry to get to and from the island for several months till it was repair. Also a special note for those who lost their lives on that tragic night. Queen Isabella Causeway after Dark Pano – Looking out on the Queen Isabella Causeway after dark you can still see a little color in the sky from the sunset earlier in the evening. This bridge is two miles long and is the only route in to South Padre Island. The light on the bridge are reflecting back in the water after dark. Posted in Photo of the Day and tagged coast, dark, laguna madre, pano, panorama, Queen Isabella Causeway, Queen Isabella Causeway after Dark, south padre, south padre island, sunset, twilight on November 28, 2018 November 28, 2018 by Bee Creek Photo. Oueen Isabella Memorial Causeway Panorama – Queen Isabella Memorial Causeway Bridge is the only road to South Padre Island from Port Isabel. Many tourist come to Padre Island for the blue waters and the miles of white sandy beaches. The area is also supported by commercial fishing, tourism, and the petroleum industry. In 1978 the Port Isabel Ship Channel was dredged to thirty-six feet in depth and 200 feet in bottom width to allow larger barges and ship. South Padre island is located in south Texas and not far from the Mexico US border. This is in far south Texas but it is visited by many who come for all over for the nice subtropical weather and white sandy beaches every year. This is also a popular spot for spring break but it also has a large RV following especially in the off seasons. Oueen Isabella Memorial Causeway Panorama – Queen Isabella Memorial Causeway Bridge is the only road to South Padre Island from Port Isabel. Many tourist come to Padre Island for the blue waters and the miles of white sandy beaches. The area is also supported by commercial fishing, tourism, and the petroleum industry. In 1978 the Port Isabel Ship Channel was dredged to thirty-six feet in depth and 200 feet in bottom width to allow larger barges and ship. South Padre island is located in south Texas and not far from the Mexico US border. This is in far south Texas but it is visited by many who come for all over for the nice weather and white sandy beaches every year. Posted in Photo of the Day and tagged barges, beach, border, bridge, Bridge to Padre Island, bridges, Brownsvile, coastal landscapes, fishing, gulf, island, landscape, landscapes, Mexico, nature, ocean, ocean landscapes, padre island, para sailing, Port Isabell, Queen Isabella Memorial Causeway, sea, ships, south padre, south padre island, south texas, surfing, texas, Texas beach, tourism, toursit, tropical, US, view of causeway to Padre island, view of padre island, water, white sandy beaches on November 27, 2018 November 27, 2018 by Bee Creek Photo. 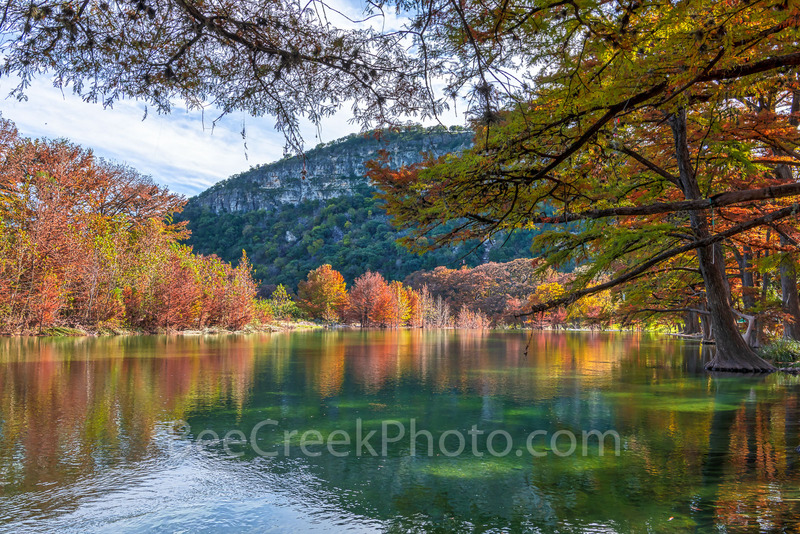 Fall in the Texas Hill Country – Texas hill country landscape canvas and prints – This is the clear waters of the Frio River as it flow downstream from Garner State Park with the cypress trees and maple trees lining the river showing their fall color on this day. The sun was just at the right level to send it rays through this cypress tree and shine down into the river and show all the river rocks. Autumn in the Texas hill country is my favorite time of the year it can be colorful as the cypress turn this rusty shade of orange to red and the maple change from yellow to orange along the blue green waters of the Frio river in this texas landscape. In the background you can see Old Baldy from the other side of Garner State Park a favorite climbing spot for many to the area. 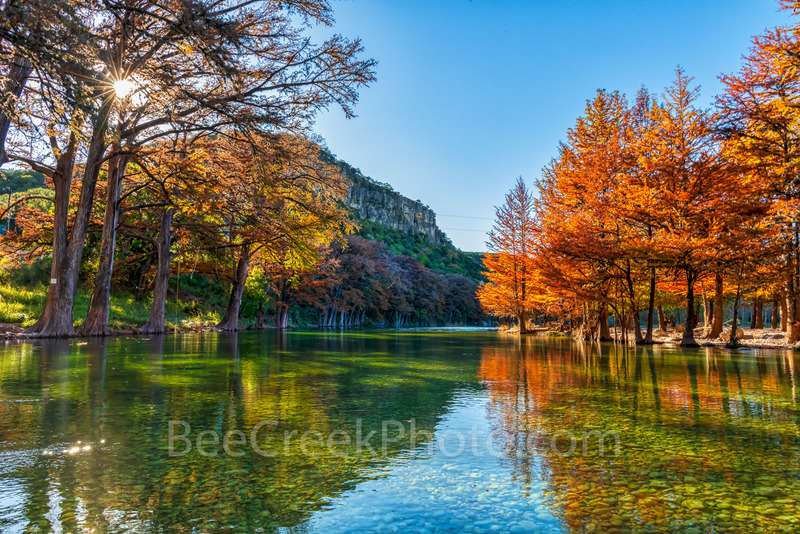 Fall in the Texas Hill Country – Texas hill country landscape canvas and prints – This is the clear waters of the Frio River as it flow downstream from Garner State Park with the cypress trees and maple trees lining the river showing their fall color on this day. The sun was just at the right level to send it rays through this cypress tree and shine down into the river and show all the river rocks. Autumn in the Texas hill country is my favorite time of the year it can be colorful as the cypress turn this rusty shade of orange to red and the maple change from yellow to orange along the blue green waters of the Frio river in this texas landscape. The water was running faster than normal after a storm the night before so I had to very carefully work my way out into the waters as they were flowing over the low water crossing just below my knees so there was little room for error. My partner remind me to keep the camera out of the waters if I go in. You can see Old Baldy in the background a favorite climbing spot for many tourist to the area. Posted in Photo of the Day and tagged autumn, canvas, clear, colors, cypress branches, cypress tree, fall, Fall Foliage, Frio river, Garner State Park, hill country, hillcountry, landscape, maples, old baldy, prints, texas, Texas Hill Country, texas landscape, Tod Grubbs, water on November 16, 2018 by Bee Creek Photo. Fall at Garner State Park – Texas Landscape Fall Prints and Canvas – The long branches of the cypress trees stretch out their limbs over the Frio river as it flows downstream toward the Old Baldy before it makes a turn downstream. You can see the fall rusty red colors in the cypress trees along the bank of the Frio. The sun was shining on the other side and you can see the color changes of the maples and reflect the colors back into the waters. After some heavy rains the water was flowing on the Frio river through Garner State Park so the cypress were in the water so I waded out into the cold waters and capture this image so I could capture Old Baldy in the back ground in this photo. Fall at Garner State Park – Texas Landscape Fall Prints and Canvas – The long branches of the cypress trees stretch out their limbs over the Frio river as it flows downstream toward the Old Baldy before it makes a turn downstream. You can see the fall rusty red colors in the cypress trees along the bank of the Frio. The sun was shining on the other side and you can see the color changes of the maples and reflect the colors back into the waters. After some heavy rains the water was flowing on the Frio river through Garner State Park so the cypress were in the water so I waded out into the cold waters and capture this image so I could capture Old Baldy in the back ground in this Texas Hill country photo. Posted in Photo of the Day and tagged autumn, branches, colorful landscapes, colors, cypress branches, cypress tree, fall, fall at garner state park, fall colors, Fall Foliage, Frio river, Garner State Park, landscape, maples, old baldy, oranges, red, reflect, Texas Hill Country, texas landscape, water, yellow on November 14, 2018 by Bee Creek Photo. 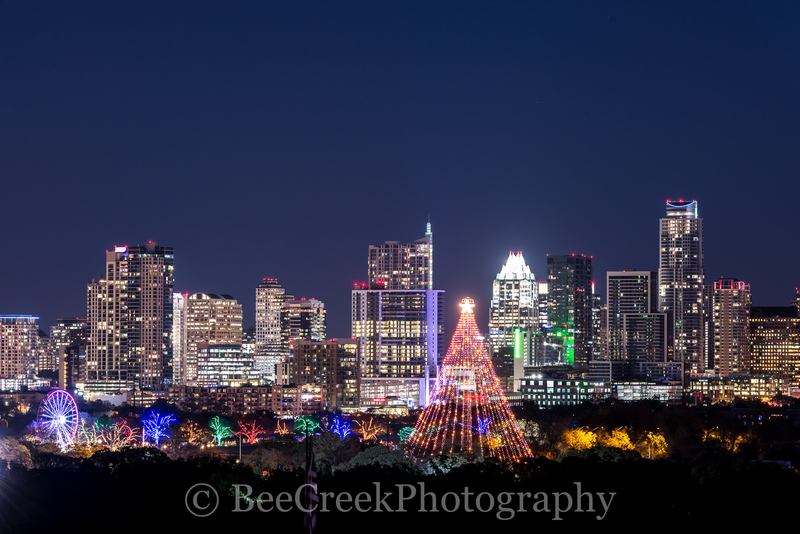 Austin Zilker Christmas Tree and Trail of Lights – This is image of the skyline with the Austin Trail of Lights along with Zilker Chrismas Tree in view. We capture this image with all the iconic high rise buildings like the Frost, the Austonian, Austin 360 and many of the new building recently built. This is an Austin tradition since the 60’s. Every year starting in December the trail opens to the public with all of the holiday christmas themes along the trail or you can go dazzle yourself by spinning under the oversize Christmas tree of lights! This makes an excellent christmas card too for your employees, friends, and family. Austin Christmas Tree – This another image of the Zilker Christmas tree along with the trail of light with the Austin skyline as the backdrop. You can’t celebrate the holiday season her without at least one trip down to the trail of lights. Posted in Photo of the Day and tagged Austin 360, Austin Christmas Tree, Austonian, christmas season, christmas theme, city, cityscape, downtown, Frost, holiday, season, skyline, skylines, texas, Trail of lights, Zilker Christmas Tree, Zilker Tree on November 13, 2018 November 13, 2018 by Bee Creek Photo. Ozarks Covered Bridge in Fall – We came across this covered bridge in the back road of the Ozarks with it fall orange colors of the maples were on display next to the covered bridge that crossed over the Buffalo River. There is a mix of orange, reds, and green from the pine nearby to give this capture a cool fall vibe.The Buffalo River, located in Northern Arkansas, was the first National River to be designated in the United States. The Buffalo River is 153 miles long. In my neck of the woods you don’t come across these wonderful coverered bridges so it was a cool find. On the back roads of the national forest you come across so many different thing along with the added bonus of a bridge almost in the middle of nowhere in it nature state and still be used. Ozarks Covered Bridge in Fall – We came across this covered bridge in the back road of the Ozarks with it fall colors oranges of the maples trees were on full display next to the covered bridge that crossed over the Buffalo River. There is a mix of orange, reds, and green from the pine trees nearby to give this capture a cool fall vibe.The Buffalo River, located in Northern Arkansas, was the first National River to be designated in the United States. The Buffalo River is 153 miles long. In my neck of the woods you don’t come across these wonderful coverered bridges so it was a cool find. On the back roads of the national forest you come across so many different thing along with the added bonus of a bridge almost in the middle of nowhere in it nature state and still be used. Posted in Photo of the Day and tagged arkansas, autumn, back road, bridge, buffalo river, color, covered bridge, fall, fall colors, fall scenery, green, maple, national forest, nature, orange, Ozark, ozarks, pine, tree on November 13, 2018 November 14, 2018 by Bee Creek Photo. Rural Covered Bridge Fall – On the back roads of the Ozark we found this covered Bridge with all the autumn colors around it. In this scene this old bridge sets the stage for this wonderful fall scenery as it cross over the buffalo river below. The sugar maples seem to surrounded this old bridge just for this picture perfect moment for a beautiful scene. This area is part of the Ozarks National Forest in Arkansas from some of the back roads along this scenic drive. Fall in arkansas was a real surprise as this year trees really puts on a show with some fantastic fall scenery and color that we never knew was so close to us. Our plan was to go to the Smoky mountains but the weather wasn’t working out so we reschedule for Arkansas and it did not disappoint us with great fall colors. Rural Covered Bridge Fall – On the back roads of the Ozark we found this covered Bridge with all the autumn colors around it which created this wonderful fall scenery as it cross over the buffalo river below. The sugar maples seem to surrounded this old bridge just for this picture perfect moment for a beautiful scene. This area is part of the Ozarks National Forest in Arkansas from some of the back roads along this scenic drive. Fall in arkansas was a real surprise as this year trees really puts on a show with some fantastic fall scenery that we never knew was around. Posted in Photo of the Day and tagged arkansas, autumn, beautiful fall scenery, bridge, buffalo river, covered bridge, fall, fall scenery, fall season, green, maples, October, orange, Ozark, Ozarks National Forest, rural, scene, scenery, scenic, season, water on November 9, 2018 by Bee Creek Photo. Covered Bridge Reflections – We decided to photograph this covered bridge from below along the Buffalo creek inorder to get this reflections in the water. We had this wonderful maple tree with it fall colors on display along side of the bridge with this creek flowing into a larger pool of water and giving us this wonderful reflection of the bridge. 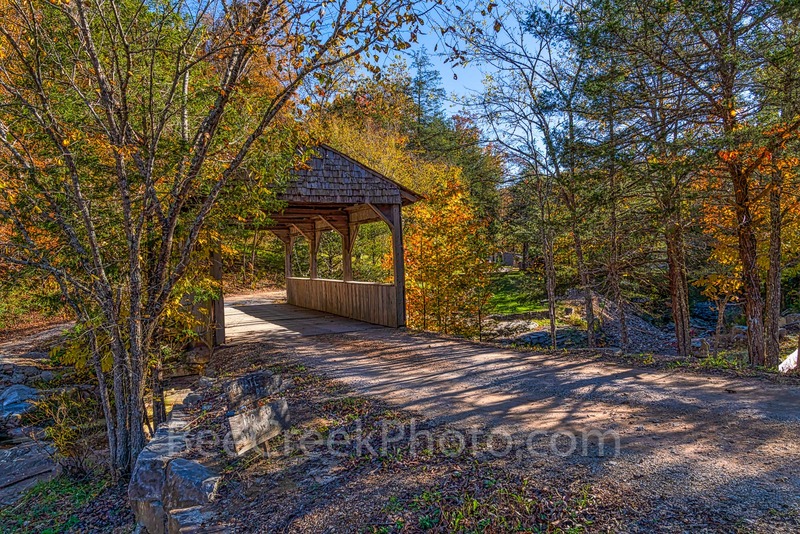 This area of the country is part of the national forest in the Ozarks and is beautiful in fall with so much color. We were pleasantly surprised that their was so much color left in the ozarks national forest. We had planned to go to the Smokie mountains but the weather was not going to work so we re-routed to Arkansas and happy we did. 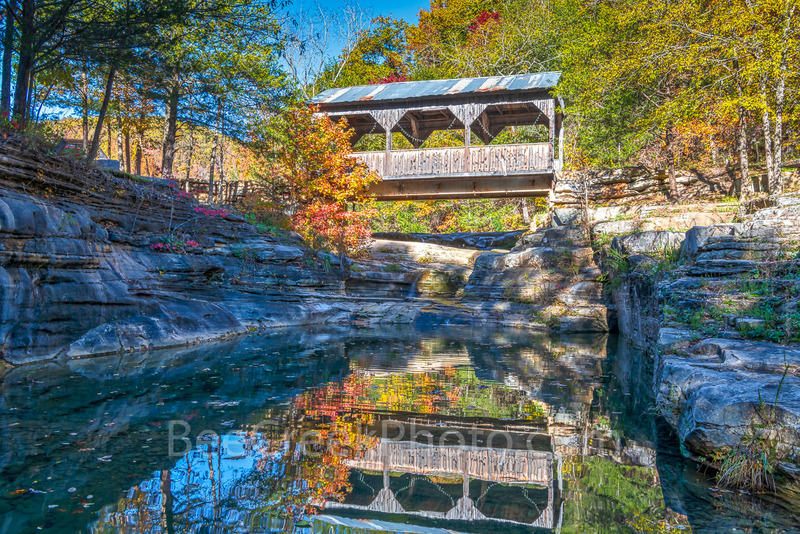 Covered Bridge Reflections – We decided to photography this bridge below from the Buffalo creek in the Ozarks with this wonderful maple tree with it fall colors on display with this creek flowing into a large pool of water and giving us this wonderful reflection of the bridge for a nice autumn day. This area of the country is part of national forest near the Ozarks and is beautiful in fall with so much color. Posted in Photo of the Day and tagged autumn, bridge, buffalo creek, buffalo river, color, covered bridge, creek, day, fall, forest, maple, natural, ozarks, pool, Reflection, reflections, water, wilderness on November 8, 2018 November 9, 2018 by Bee Creek Photo. 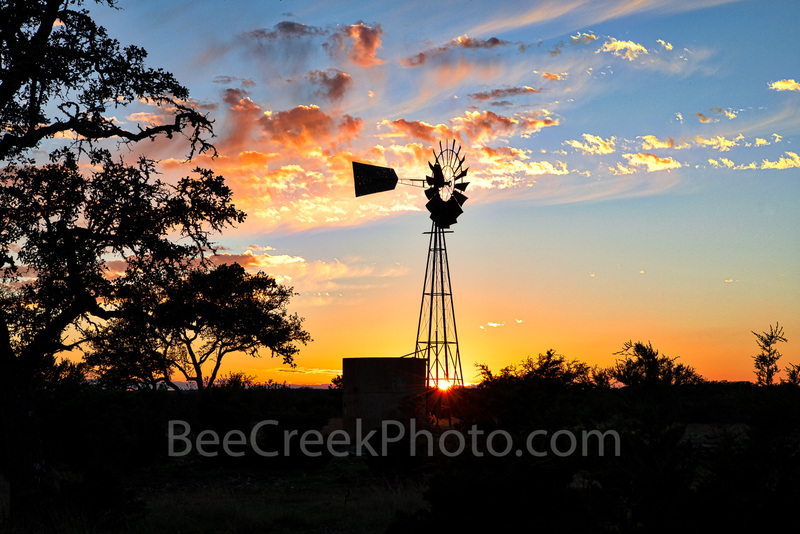 While on the way back from the far reaches of the Texas Hill Country chasing fall colors we came across this windmill just as the sun was setting. I have been looking for a windmill with a sunset for along time and finally caught one at the right time and place. We took a different route back from taking images of the fall colors and had seen many nice windmills on the way but they were in the wrong direction. Most had wires or were too far from the road and such. On the way up the last hill before the highway I saw this windmill but it appeared to be on the right side of the road as the sun was setting with a beautiful sky but at the last turn it ended up being to the west as we drove by. I wiped a u-turn pulled off the road jumped out of the truck grabbed the tripod and camera and ran over to the fence just in time to capture this image of the windmill in silhouette as the sun was setting. Texas Windmill at Sunset – Texas landscapes canvas and prints – As we were leaving Garner State Park area we came upon this great big wind mill with it water tank just at sunset. The blades on this windmill were more than twice the size of the ones near our home So of course we stopped and captured this silhouette of this windmill and water tank in a Texas landscape as the sun last twinkle shines through at the bottom before it went below the horizon. Wind mills in this area are much bigger than other areas, the blades were more than twice the size of others we have seen near our home, I don’t know but I suspect they have to be larger to bring up the water at a greater dept or to generate electricity in the Texas Hill Country than else where, only a guess. Windmills are a symbol of Texas landscapes everywhere you go you can find windmills in Texas. Posted in Uncategorized on November 7, 2018 by Bee Creek Photo. Austin Skyline Panorama – We captured this aerial Austin skyline panorama of the cityscape looking straight down Congress Ave using our drone to photography over the city. This wonderful Austin skyline was capture looking up congress avenue all the way to the Texas Capital. In this Austin skyline you can see many of the city high-rise buildings including the Frost, Austonian, W Hotel, Austin 360 CondosOne Congress Plaza, Radisson Hotel, Marriott, Four Season Hotel, along with the Ashton Condos, and One Congress and a bit of Lady Bird Lake. Looking up congress avenue you can the Texas State Capital which is the hub of Central Texas. Austin is the location for the University of Texas flagship campus, high tech companies, and is also known for its live-music scene centered around country, blues and rock. Its many parks and lakes are popular for hiking, biking, swimming and boating. West of Austin is Lake Austin plus Lake Travis and South of the city, is the Formula One Circuit of the Americas raceway to name a few thing around town. Posted in Best Of and tagged 360 Condos, aerial, Ashton, Ashton Condos, Austin skyline, Austin skyline panorama, Austonian, beecreekphoto.com, buildings, Capital, Capitol, city, cityscape, Congress Ave, downtown, Four Season Hotel, Frost, high rise, Lady Bird Lake, Marriott, One Congress, One Congress Plaza, pano, panorama, Radisson, skyline, skylines, Tod Grubbs, W Hotel on October 25, 2018 October 25, 2018 by Bee Creek Photo.